A first for Santa Barbara Unified School District, Summer XL extended learning opportunities give students more course options during the school year. Santa Barbara Unified School District is offering its own summer extended learning, also known as Summer XL. A first for the district, Summer XL includes courses for acceleration as well as learning and credit recovery. Summer extended learning opportunities have historically been orchestrated through Santa Barbara Education Foundation, and while some summer program opportunities will still remain with the Foundation, the district is now able to expand learning opportunities to allow for better alignment of classes, grades, and transcripts at district schools. 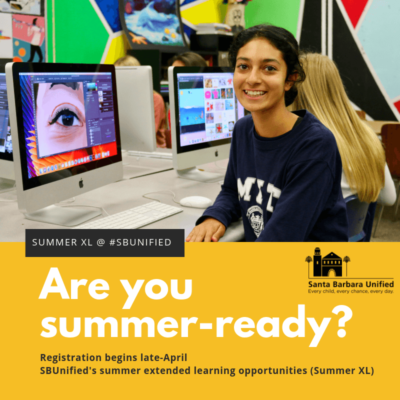 Summer XL registration will begin late April with courses offered at all three traditional high schools a part of Santa Barbara Unified School District, including Dos Pueblos High School, San Marcos High School, and Santa Barbara High School. The first session, which fulfills a semester of credit, starts on Thursday, June 13 and lasts until July 3. The second session, which is equivalent to a second semester, begins July 8 and ends July 26. Class offerings can include courses in Health, and American Government P and Economics P. Health will be offered face-to-face in a traditional format. American Government and Economics will be offered as online options during the first session. All Summer XL courses will be subject to student registration and availability of instructors. Each high school will send letters to students and families regarding which classes will be at each site. Interested students and families are encouraged to consult with their high school counselor to determine the best options and for registration forms once they are made available. SB Unified also proudly partners with SBCC dual enrollment, giving students additional options to take summer courses through that program. Santa Barbara Unified School District junior high schools and specialized summer programs, such as PEAC Summer Bridge and Special Education Extended School Year (ESY), have alternate dates. As in previous years, Extended School Year (ESY) services will be offered for students with disabilities if determined necessary by the students’ Individualized Education Program team. Junior high or incoming 9th grade students who struggle academically may also be offered literacy or math support summer learning opportunities. Families are encouraged to contact their child’s junior high school for specific dates if their child participates in any of these programs.